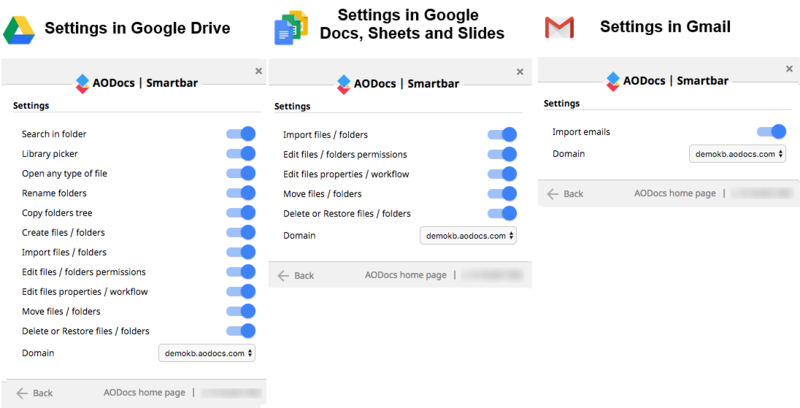 The AODocs Smartbar brings AODocs features in the Google Drive, Google Docs/Sheets/Slides and Gmail interfaces. You can activate and deactivate these features. When the AODocs Smartbar is installed and activated, a status button is displayed in color at the right end of the Google Chrome URL bar. 1. Press the Smartbar button in the top right of your screen. The Status pop-up opens and shows the status of each Smartbar feature available for the page displayed. Note: The Settings pop-up appears in Gmail, in Google Drive and in the Google editor interface. The content of the pop-up is specific for each interface according to which features can be triggered. Green checkmark: indicates that the Smartbar is working correctly. Red cross: indicates that the Smartbar is not available. This may be due to a communication issue between the Smartbar and the AODocs Application Programming Interface (API); or an issue with the Google Drive settings — the Smartbar works only if the files are displayed as a list. Orange exclamation mark: indicates that the Smartbar may be unavailable. This may be, for example, because the page structure is invalid or the page structure is not detected by the Smartbar. Grey text: indicates that a feature is disabled from the Smartbar settings. 3. If your permissions on a library have been updated while your Smartbar was already working or if you notice some unavailabilities, press the Reload button. The Smartbar may also display a red banner indicating that you need to reload the page. After reloading, the Smartbar re-initializes on all the tabs open in your Chrome session. 1. Press the Smartbar button in the top right of your screen. The Status pop-up opens. 2. Press the Settings button. 3. Use the switch to the right of each Smartbar feature to enable or disable it. 4. If you want to activate permissions for the Gmail interface (for example, if you didn't enable Smartbar features for Gmail when you installed the Smartbar), activate the Import emails switch. 5. 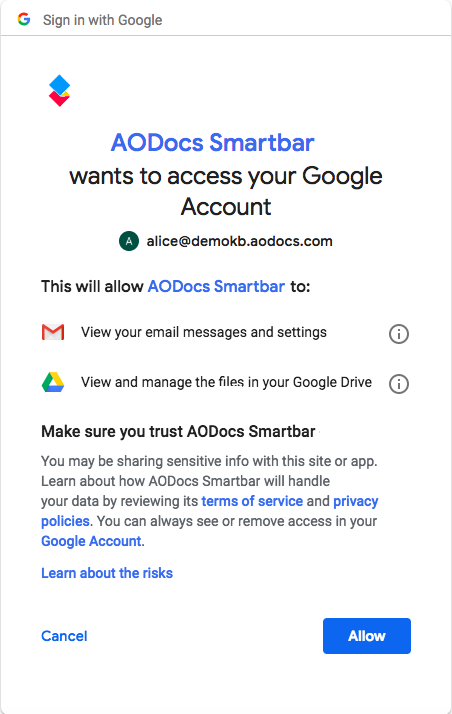 The AODocs Smartbar — Request permissions pop-up opens. Press Allow. 6. The permissions required by AODocs to interact with Google Drive and Gmail are listed. Press Allow. Learn more: Manage the AODocs Smartbar permissions. The Smartbar features are enabled for one specific domain at a time. If you want to access AODocs libraries from another domain, don’t forget to switch the domain on the Smartbar Settings. Learn more: AODocs Smartbar multi-domain usage.